Natural rubber latex and chemicals after being tested and accepted are used for compounding process. 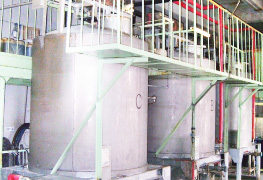 Compounded latex and ground chemicals are sent to the mixing tank. Latex and chemicals are compounded well and after they get passed the properties test, they, as accepted raw materials, are supplied to next process, that is dipping process. Glass molds are dipped into the dipping tank filled up with raw materials while moving on. Glass molds with raw materials put on are then sent to drying tunnel. Glass molds are heatedand form rings at the open end by roll up machine. 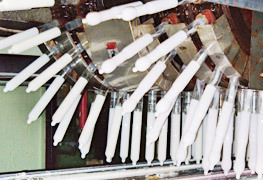 Once condoms are passed sampling test, then supplied to next process, vulcanizing process. All the condoms are tested pinholes by electric resistance. 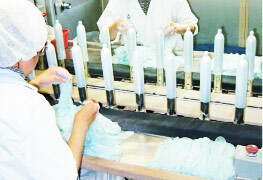 The condoms are inspected continuously by testing molds made of chrome plated carbon steel installed on chain conveyor. Foil packing machines are heated seal type. 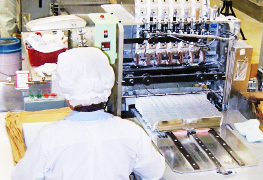 Lubricant supplying device and empty pack detector are equipped with the machine, therefore, lubricant is automatically supplied right before sealed.